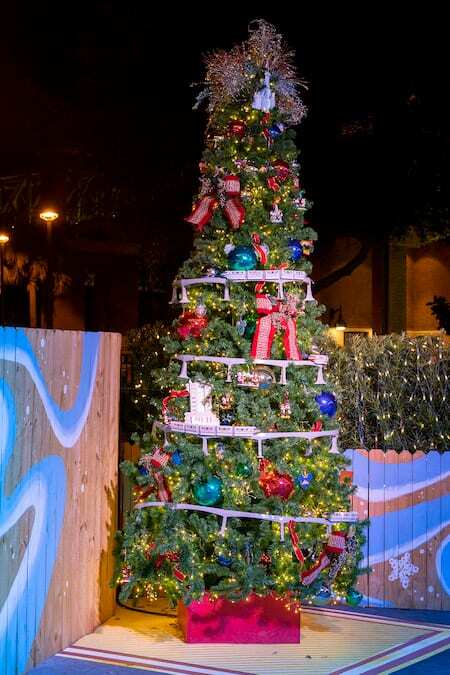 I’ve often heard that the third time’s the charm, and when it comes to The Disney Springs Christmas Tree Trail, I’m pretty sure it’s true! 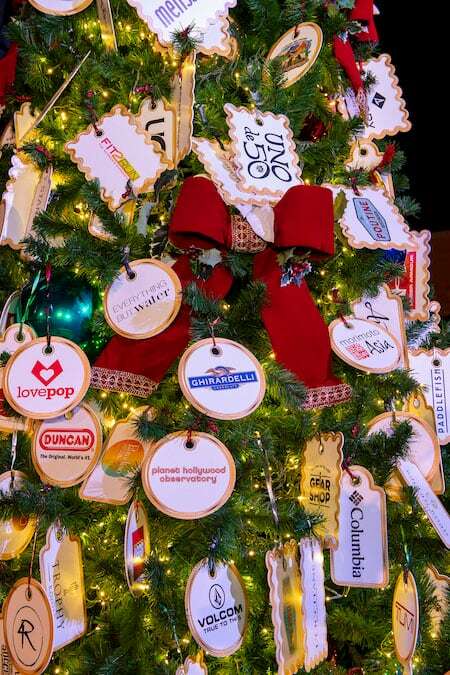 Back for its third year at Disney Springs Marketplace, the limited-time holiday tradition now boasts 27 trees, including five new themes – my favorite tree of the trail among them! 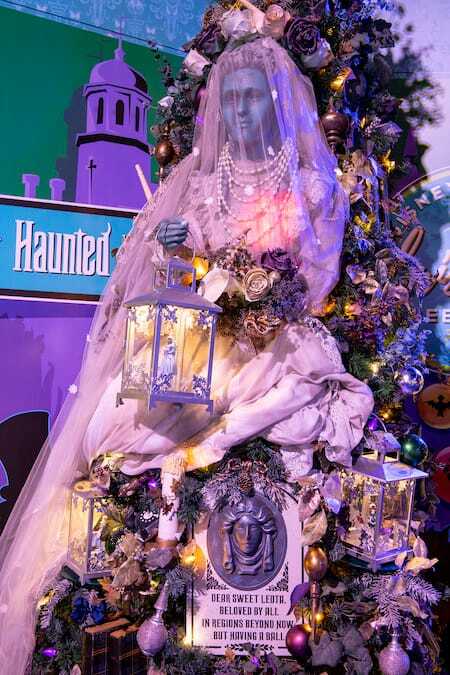 Haunted Mansion: While they’re all impressive, I was completely blown away by the detail of the Haunted Mansion tree, my new favorite, complete with a ghostly, glowing bride that will feel familiar to anyone who loves the classic attraction. It’s spooky, and certainly not traditional, but that’s what I like about it – it feels a bit unexpected in the midst of this winter wonderland. 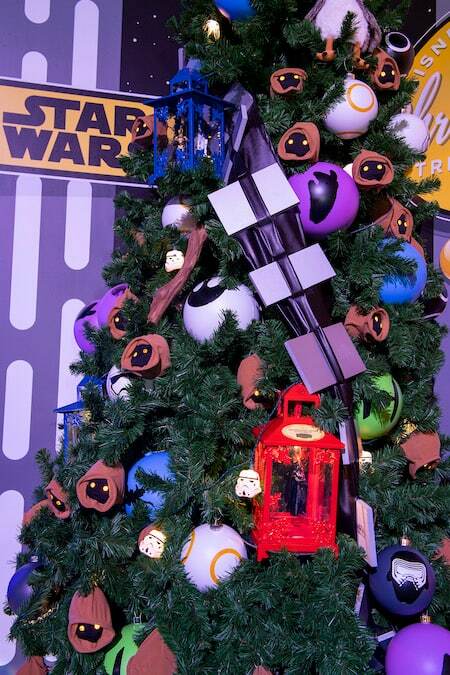 Star Wars: Flanked by two smaller trees to represent the “dark side” and the “light side” (one is adorned with red lights, the other with blue), plus a variety of ornaments featuring everything from miniature Jawas to tie fighters to the rebel alliance emblem, the Star Wars-inspired tree is a visual delight for aficionados of the film. No star required, it’s topped by a lightsaber, making it a show-stopper even for casual fans of the franchise, including yours truly. “Toy Story”: Toy Story Land opened earlier this year at Disney’s Hollywood Studios and the trailer for “Toy Story 4” has already amassed millions of views. 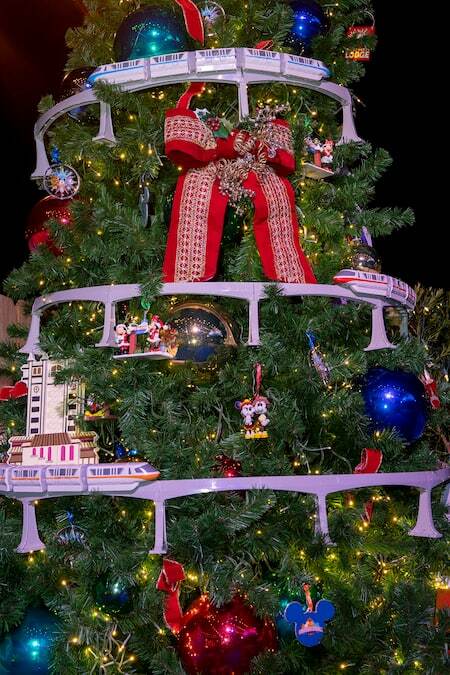 It’s safe to say that interest in “Toy Story” is still strong, so this tree was a perfect addition! 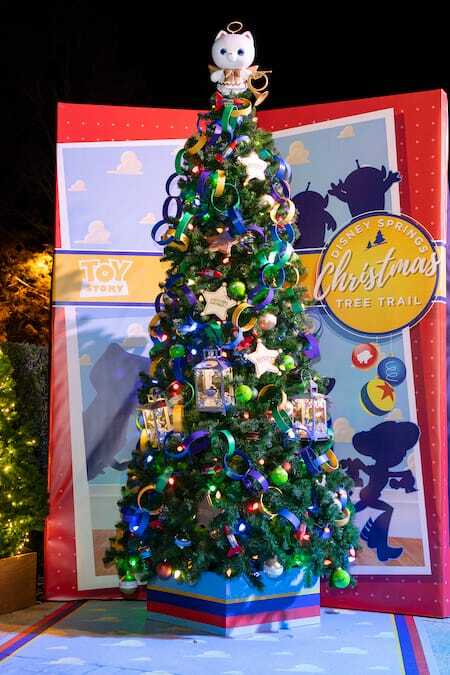 In a mash-up that includes Woody’s Sheriff badge, Slinky Dog, little green men, the Pixar ball, garland made of “paper” rings, and more, this tree offers a playful punch that will remind you of your grade school days – at least that’s what it did for me! 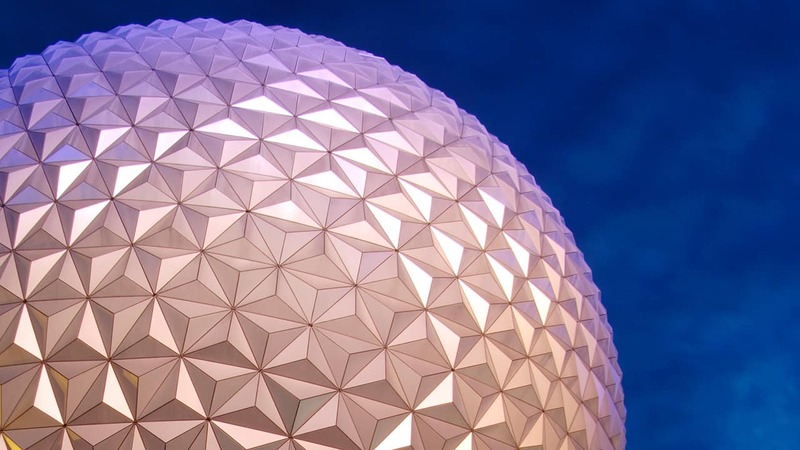 The Walt Disney World Theme Parks: Look for icons representing each of the four Walt Disney World Theme Parks (Magic Kingdom Park, Epcot, Disney’s Animal Kingdom and Disney’s Hollywood Studios) and marvel at the miniature monorail circling the tree. Colorful flare at the top of the tree gave me visions of our spectacular fireworks displays, which has me thinking that I need to plan a mid-December visit to Magic Kingdom Park to see “Holiday Wishes” – one of my favorite shows! 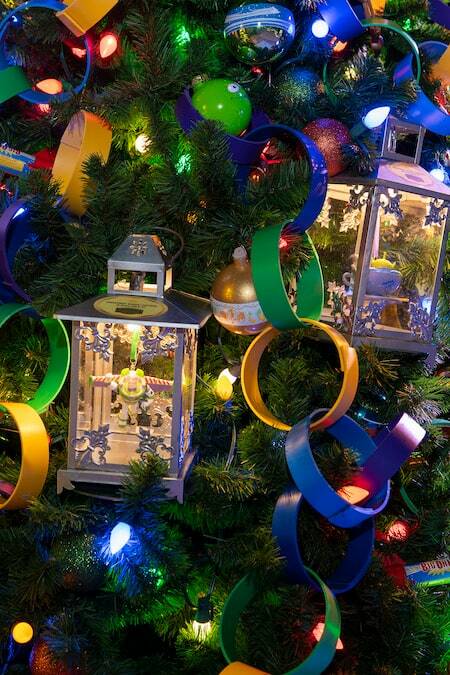 New this year, look for lanterns on each tree that showcase featured ornaments available for purchase at the nearby Disney’s Days of Christmas shop, available while supplies last. 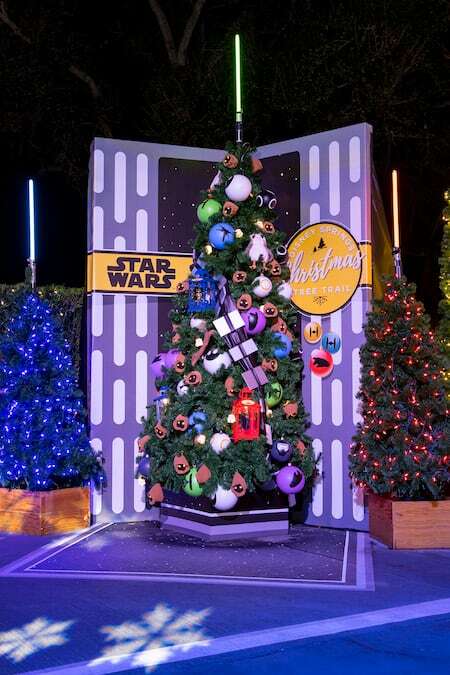 Also take note of the signage on the walls – they offer up clever nods to many of the beloved stories, attractions and characters represented in the Disney Springs Christmas Tree Trail. 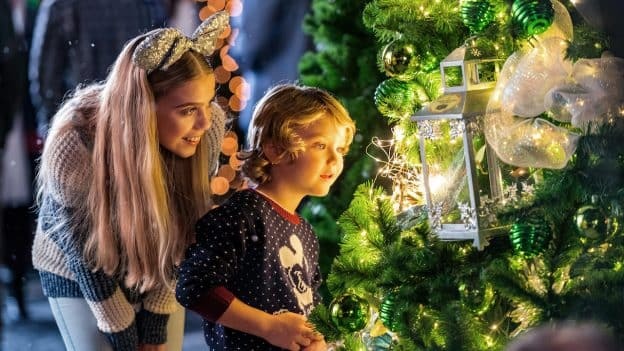 For the ultimate visit, wear your Disney Jingle Bell Light Up Holiday necklace as you meander through the experience – with multiple light settings, you’ll be as festive as the fully decorated trees. (Bonus: Day or night, it’s a great conversation starter; I’m speaking from experience here!) Find the necklace at World of Disney or other select locations throughout Walt Disney World Resort. 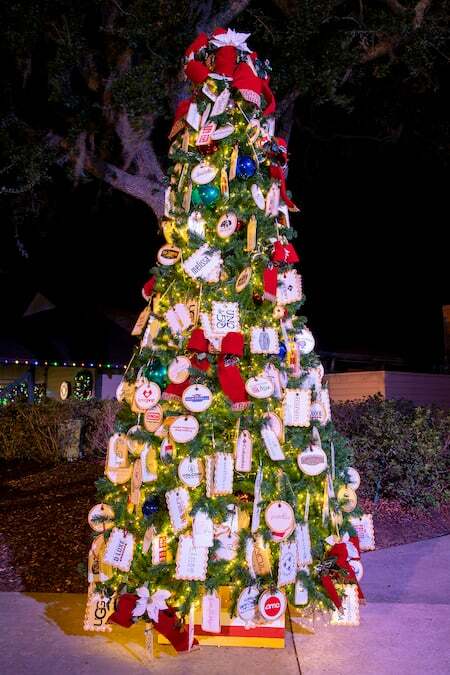 Have you had a chance to visit the Disney Springs Christmas Tree Trail yet this season? If so, let me know which tree is your favorite in the comments below – I’d love to know! I agree, 3rd time is the charm! We did the Christmas Tree Trail and this is the best year by far. We loved all the new trees and the whole experience. It’s definitely a must do on anyone’s list. Need to take my wife soonest as she is on her last chemo treatment. Haunted Mansion in spite of the 12 hour clock. My family and I visited a few weeks ago. It was a wonderful experience (especially at night) with the beautiful trees, falling snow and Christmas tunes. 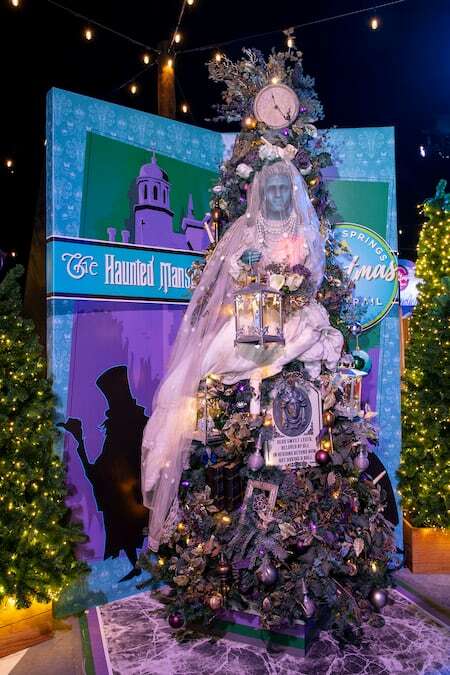 I loved the Haunted Mansion tree!